Leafdog Games is in the house (or at least knocking at the door)! I skipped a few LDs along the way, but hopefully got better at designing, prototyping and programming in the meantime. Up to now I’ve only joined the Compo side (and a Warmup) of Ludum Dare, but this time I decided to team up with my brother (@SidneySacchi) – as Leafdog Games (@LeafdogGames) – and join the #LDJAM with him. We have recently released a Unity, enhanced version of a free short point and click adventure of mine, named A Night That Wouldn’t End, originally developed with Adventure Game Studio. So we decided to strike while the iron is hot! Also, it’s his first game jam ever, so it will be superfun to see what we come up with. Who knows… Maybe another point and click adventure? Are there any aficionados out there? Ok, enough, we’ll see where this goes! Good luck to everybody joining #LD34! Can’t wait to start jamming and play your games! Mah-Le-Cuh-PEW v1.2 (PostDare): Bugfixes, Better AI, What’s next? I’ve fixed a few bugs that were making the AI constantly follow the player, now it uses a litte bit of strategy to avoid getting hit! Also I’ve tweaked the “PEW” volume and the amount of energy of both AI and the Player, so that it should be more easy to get some score. I’ve learned A LOT during the development of this prototype, also thanks to all the great tips I received by all the other fellow darers. What I’d like to do now is to add some polish to it, enhancing some of the feedback that it gives to the player. Also, I’d like to introduce also a knockback mechanic, so that once one of the two fighters is hit by a bullet, may risk to fall into oblivion. This could make the pace of the game hastier and more intense. Of course, without implementing and testing, these are only “potentially good ideas”. I still have to sort out how to make a knockback possible while using Unity’s NavMeshAgent for the AI (considering that I’m no AI expert, nor am I using Unity Pro). I’ve uploaded the first PostDare version of Mah-Le-Cuh-PEW which now has a Single Player mode with support for Keyboard movement and Mouse aim/shoot. Also includes small tweaks and bugfixes. 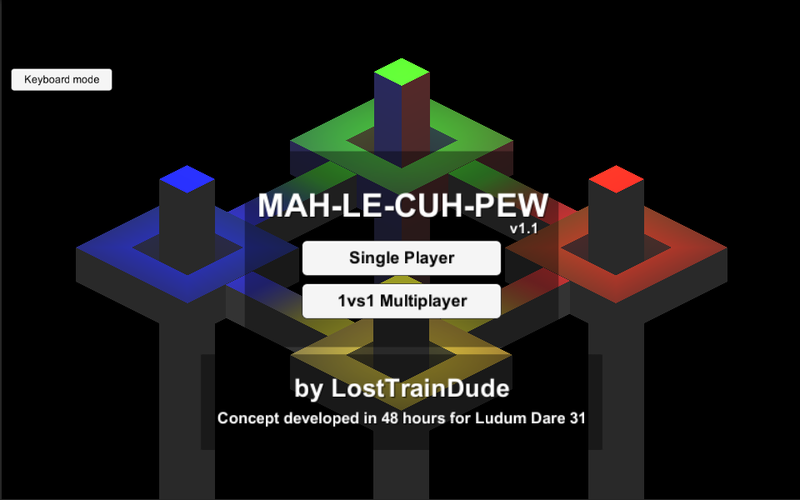 Mah-Le-Cuh-PEW (Original Ludum Dare version) is a 1vs1 Local Multiplayer Isometric Shooter in which two opponents face each other on the edge of oblivion. The Original Ludum Dare Version features only Local Multiplayer and can be only played with Gamepads. Jump on my SoundCloud page to listen to more chiptunes made with LSDj! My first Ludum Dare entry ever. I’m so excited that I can’t get to sleep even if I’m completely out of energy! I spent most of the 48 hours drawing pixels in Hexels and trying to make them move in Game Maker, trying to find a way to connect those two planets I drew on the screen. Then the little spark arrived and made room for an avalanche of ideas which I had to skim almost entirely. I’m too bad as a programmer to make those ideas actually work in just 48 hours. In a nutshell: a trading game in which you must lead a planet to a new beginning by tradingcreating what your citizens demand. The game was developed with GameMaker: Studio (Standard Edition). That’s why the build is currently available on Windows only. All graphics were made with Hexels Pro while the looping music was rendered from a slightly modified version of a very little ChucK script I wrote last month. I’ve tried to describe it in detail here, and as you can see it’s pretty basic (and very spaghetti as well). I really hope that this is not an issue, since I programmed it a month ago. It’s a really really simple script, which of course is also included in the source for everybody to expand and use. By the way, I hope you can enjoy this little experiment which lives by miracle thanks to caffeine, poorly managed polyphasic sleep, spaghetti code, good will and, of course, Ludum Dare! Can’t wait to play all your games and, most of all, can’t wait for the next edition! 21 queries executed in 0.072 seconds.